An article at the Urbanophile gives us a helpful graphic explaining the old and new “Donut” conceptions of the city. In the “Old Donut,” we have an impoverished central city with a ring of thriving suburbs around it. 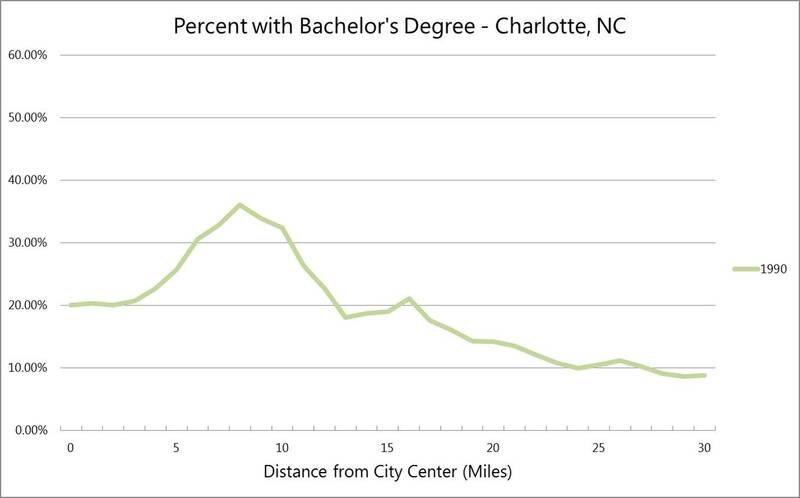 An example of that model appears in this graph, which shows the percentage of adults over 25 with college degrees in the Charlotte, NC metro area in 1990. The x-axis is distance from the center of downtown. Virginia’s immigrants: Where do they come from and where are they now? The foreign-born, or immigrants, comprise more than 10% of the Commonwealth’s population. Most of them are between 25 and 44 years of age. This young cohort is highly active both in terms of production (working) and reproduction (having children). The adult foreign-born, for example, make up 15% of the Commonwealth’s workforce; and a fifth of all native-born children below the age of 18 have at least one foreign-born parent. More details are available here. Contributions of the foreign-born population to multicultural diversity can be explored in several ways; where they come from and where they stay plays a key role in this story. A hundred years ago, most foreign-born people were from European nations; today almost 80% of immigrants to Virginia originate form Asia or Latin America. The top five countries of birth for the contemporary foreign-born population are El Salvador, India, Mexico, Philippines and Korea. What is also of significance is where these immigrants choose to live within Virginia. 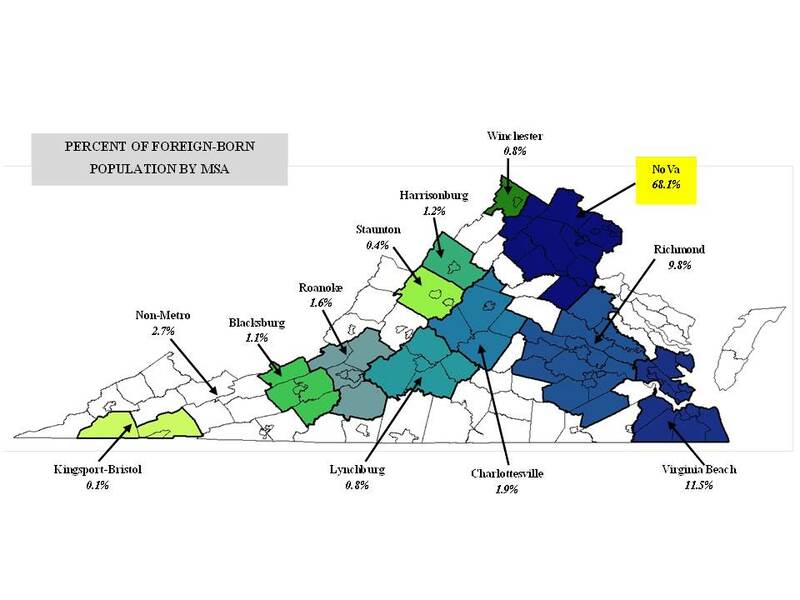 The distribution of foreign-born people among Virginia’s 11 metropolitan areas (MSAs) can be seen in the map above. Close to 70% of immigrants can be found in Northern Virginia alone, with Hampton Roads and Richmond hosting about 10% each. Among the smaller MSAs, Charlottesville leads the pack with nearly 20,000 foreign-born individuals, many of whom are students, faculty or staff at the University of Virginia. The non-metro, mostly rural areas are home to less than 3 percent of the foreign-born. 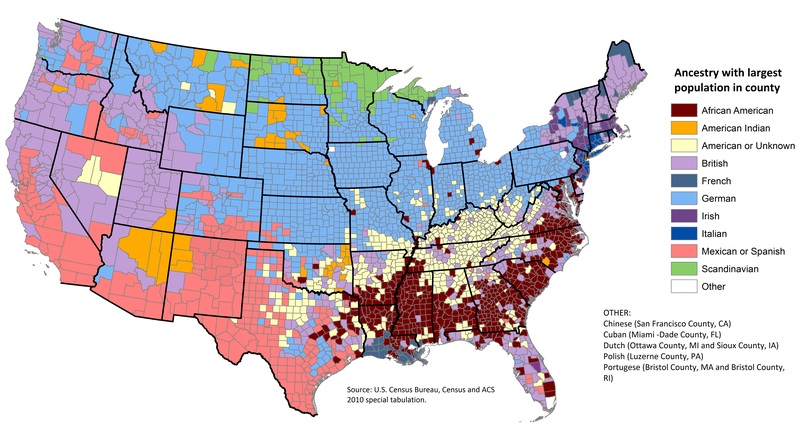 The map below shows the percentage of each MSA population that is foreign-born. Again, Northern Virginia leads the way, with nearly a quarter of its population being immigrants. 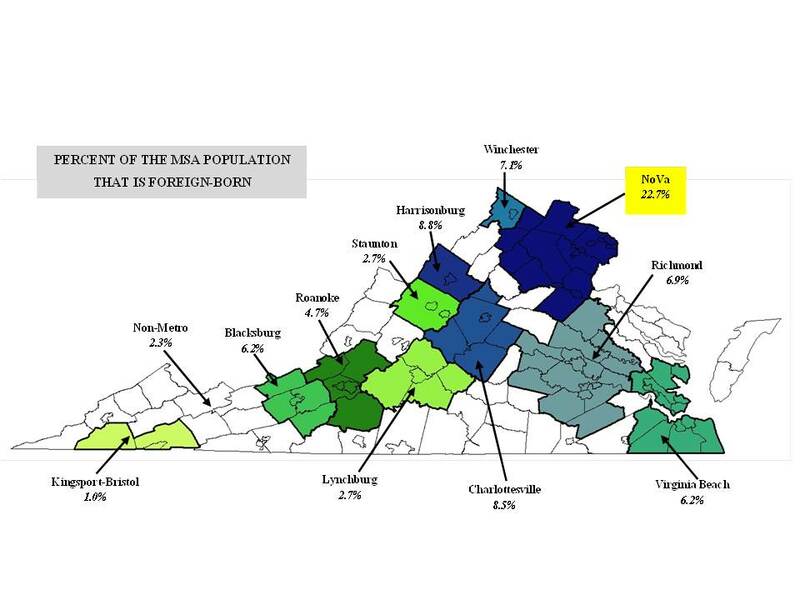 Harrisonburg and Charlottesville MSAs have a high proportion (nearly 9%) of foreign-born people, closely followed by Winchester and Richmond (7%), and Virginia Beach and Blacksburg (6%). I don’t like filling out surveys as much as the next guy. But I wouldn’t think the world would come to an end if I was told I had to do so. …the Census Bureau has used tactics such as harassing letters, phone calls, agent visits and even questioning neighbors to get information about respondents. They turned harsh words into action as The House of Representatives recently voted to eliminate the ACS, a “mandatory,” mail-based, national survey of 3 million people conducted annually by the Census Bureau. Political antics quickly followed suit. The Left was quick to admonish congressional Republicans and cast this as yet another example of Right-wing extremism. The Right feels vindicated that it has given yet another blow to a government that has overreached its authority. As a professional demographer, and one who studies and collects data on people for a living, one of the issues I frequently get asked about is privacy. 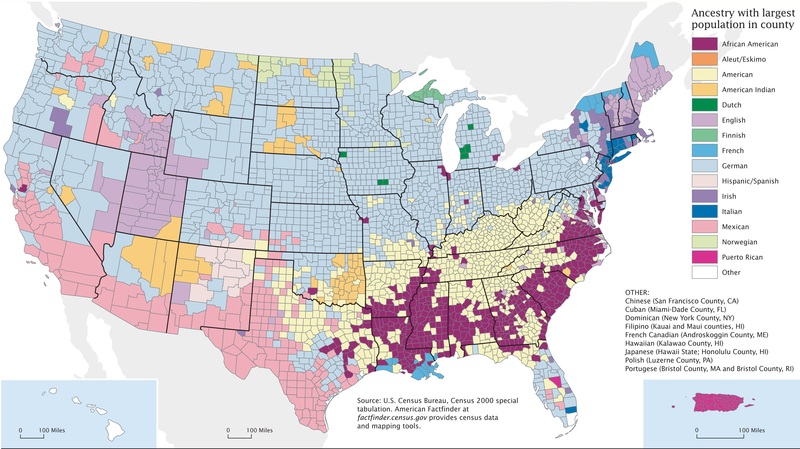 The topic has always been important in my work for the Weldon Cooper Center and it also has been front and center for the U.S. Census Bureau in recent years. For example, in 2010 the Republican National Committee passed an official resolution stating that many of the Bureau’s activities are “overreaching,” “intimidating,” and “dangerous” in regards to privacy, particularly for its American Community Survey (ACS). While I share some of the RNC’s concerns about the mandatory nature of the ACS (although the Census Bureau very rarely enforces any sort of penalty for not answering), my primary concerns over privacy lie elsewhere. The mountain of new data gathered by private corporations on what we eat, what we read, where we travel, what we buy, and how we surf the internet is bought, sold, and traded with impunity, often without us knowing about it. The U.S. Census Bureau is a bastion of privacy and protection compared to what the burgeoning data mining and micro-targeting industries do on a daily basis.